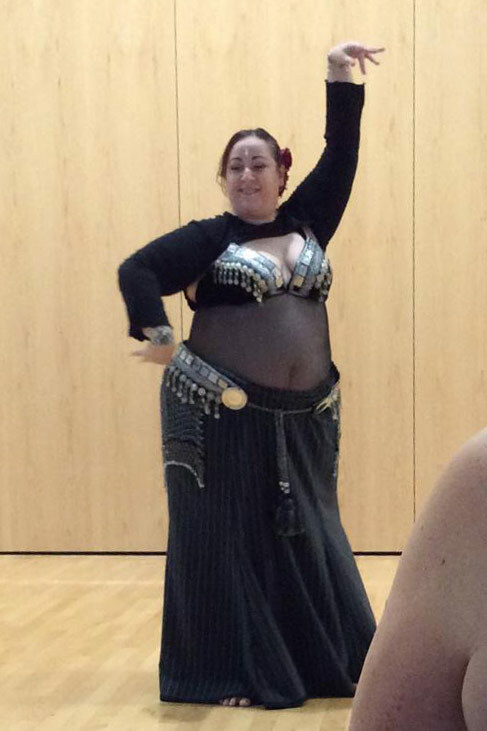 A couple of weeks ago, I was due to make a performance at a local hafla where the guest teacher was from the US, and whom I’d promised I would perform. About a week before the date, my recently sprained ankle started bugging me again, so I decided to switch my planned Fusion performance for an ATS slow solo, since it would allow me to be more careful about foot placement, and would require less travelling. Parts of it were choreographed, parts of it were improvised, parts of it were not ATS at all, but I wanted something a bit closer to the real ATS feel of improvisation this time. And yes, that is the same track I did with a friend at the ATS Residential in January. As for the costume, I’m wearing my black and silver bra and belt (process explained here), the shrug from Shimmy Sista (now fixed, you can’t see it at all! ), and a custom made to measure skirt from Belladonna’s Boudoir, same people that did my pantaloons. The skirt was never supposed to be for dancing, but it was very hot and I couldn’t face the idea of dancing wearing my velvet mermaid skirt. The hip shawl I got used from Ebay ages ago, it’s beaded and has a lovely effect of glittering with dancing, and the weight makes it work better for me than the typical disco-ball inexpensive Chinese ones. 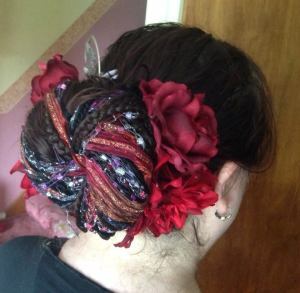 My hair for the performance was done using a hair fall that I made ages ago, twisted and mixed with my own hair, and all twisted again into a bun. I used a couple of hair clips to secure my bangs and side, then a Miao pin to secure the bun, and then a few silk flowers to finish off the look. I’m making another similar hair fall in teals and blues, so stay tune for a tutorial on making them! The result is in the video below. As usual, better watch it at full size on YouTube, even better at HD. Get a free blog at WordPress.com • Theme based on: Koi by N.Design.